Clyde continue their unlikely late push for promotion on Saturday when they travel to Cowdenbeath. It’s the Bully Wee’s second trip to Central Park in 11 days, following their 3-0 win there last Tuesday night. That pushed Danny Lennon’s side into a promotion play-off spot, although they have dropped to sixth place after Saturday’s defeat at Peterhead. The fight for the final play-off place is shaping up as a three-way battle between Clyde, Elgin and Stenhousemuir. After Saturday’s results Clyde and fifth-placed Stenny both trailed Elgin by two points, although the Warriors had two games in hand on their rivals and were due to play Berwick last night (Tuesday). 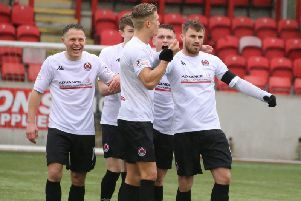 Clyde have four games to play, with Saturday’s match at Cowdenbeath followed by a home match with Stirling Albion, an away game at Edinburgh City and a home game with Berwick Rangers.